Email marketers want to maximize the value of their email campaigns, but many marketers lack the budget, resources or expertise to create campaigns that achieve the results they desire. But instead of turning to those with more experience, they grind away at it in-house or hire inexperienced developers to try and make improvements. The typical end result is a campaign that underperforms. It might even have delivery issues or it may not display properly across multiple email clients. That’s where outsourced email services can help. When you factor in the time, resources, overhead, and other expenses that it takes to develop in-house campaigns, hiring an experienced email marketing services firm is usually a more effective (and many times a more affordable) solution. The marketing insight, creative talent, coding skill, and delivery experience of an email agency will result in a far more effective email campaign. Email seems like it should be easy, but it is not. Email is hard. Even campaigns that appear to be “simple” are usually that way because of successful marketing planning and execution, and not because they are actually easy. An experienced email partner can help make it look easy because they use their expertise and industry knowledge to provide ideas that will improve your campaign. That’s something that won’t happen in house. Do you feel like your campaigns are underperforming? Not sure why? Sometimes small details can make or break a campaign. Crafting an effective subject line, using a pre-header, placing a call-to-action in the preview page, designing for mobile inbox compatibility- these are all things that savvy marketers will already have in their tool chest, but others may not. And sometimes those details are the difference between negative and positive email campaign results. When your budget is being put towards educating your in-house team, revising poor creative, and continuously tweaking your email code, your budget isn’t being allocated wisely. When you work with a veteran email marketing team, the budget can be maximized as there’s no waste due to lack of experience. If you find your campaigns are always late because your team doesn’t have the time to focus on the project, then bringing in additional help will keep your campaigns on time and more relevant. Reaching your audience at the right time with the right message is key, and missing that opportunity could be negatively impacting your campaigns. When you are being pulled in many directions, having a team that can be pro-active, deliver unique ideas, and offer strategic input will not only give you peace of mind, but will allow you to focus your attention on the big picture. Not having to micro-manage and oversee the entire process will actually save you time in the end. What new tactics are you interested in implementing but can’t find a way to try them out? Do you want to run more tests? Are you looking to do more with personalization or segmentation? Do you want to implement more automated messages? 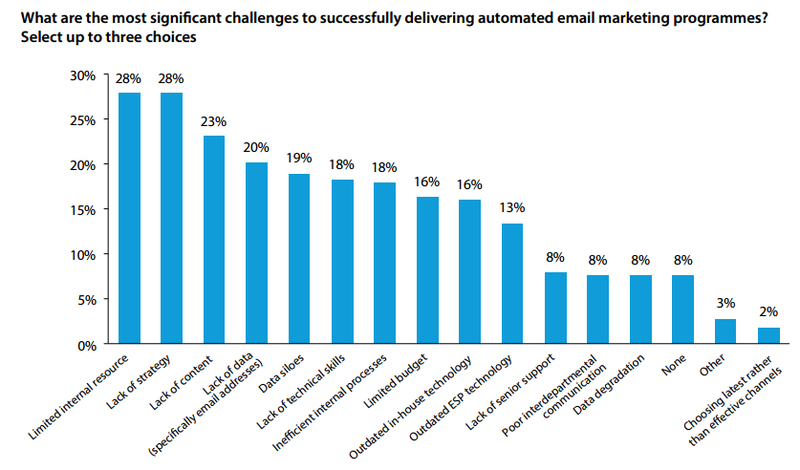 When marketers were asked about their most significant challenges to successfully delivering automated email marketing programs, limited internal resources and lack of strategy were their top challenges. 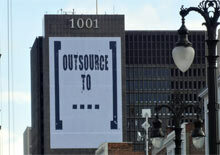 Both of these can be solved (as well as many others) by outsourcing to an email services agency. Email marketing is all about achieving business goals. If you aren’t meeting the objectives required by your organization, then your process is falling short. Bringing in expertise to review your processes, analyze your campaigns, and find areas for improvement can get your campaigns back on track and achieve the results you desire. If you choose to outsource, make sure you choose a partner that has extensive experience crafting email campaigns and providing related email services including assistance with list growth, recurring campaigns, landing pages, microsites, and anything else you may need. A partner with a client base that includes B2B and B2C businesses will be of value as all their experience will benefit your marketing efforts. If you aren’t sure if outsourcing will provide positive ROI, remember that the email service agency you select will want to prove their value. By providing an efficient, affordable solution that fills the gaps in your marketing approach, an outsourced partner may be the best thing that ever happened to your email marketing. Adam Holden-Bache is Director of Email Marketing at Indiemark, and author of How To Win at B2B Email Marketing: A Guide to Achieving Success. 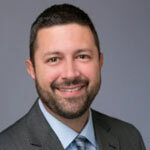 Adam provides email marketing strategic, consulting, and analytical services, and speaks, writes, and conducts workshops on email marketing and digital marketing topics.